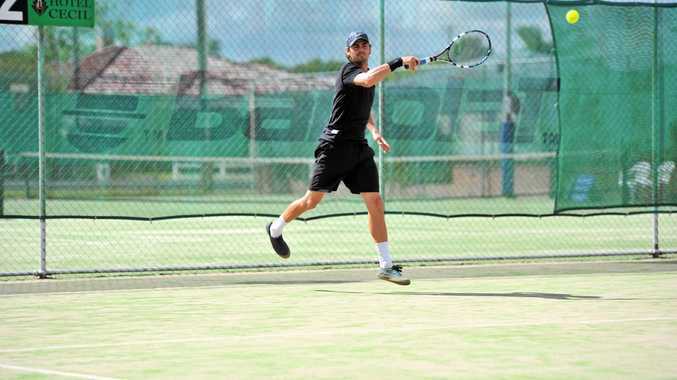 LISMORE tennis player Brendan Moore took out the Hotel Cecil Casino Open tournament for a record seventh time. Moore was top seed and beat Laurieton's Corey Clarke 6-3 7-6 in the final yesterday. It caps a big week for Moore who also won the Easter Open tournament at Coffs Harbour. He also won the Ballina New Year Open tournament for a record third time in January. Casino's Brendan Lee made it as far as the quarter-finals before he was eliminated. He knocked off No 2 see Blake Kebblewhite 6-0 5-7 7-6 along the way. Meanwhile, No 3 seed Krystal Clarke won the open women's final 6-2 5-0 after Ashley Allman retired hurt. It meant Clarke also won the under-18 girls singles. Allman had an impressive run to the final where she beat No 1 seed Amber Molloy in the quarter-finals. Clarke was made to work for it taking down defending champion Komaki Ido in the semi-finals. Lismore's Jessica Tickle gave a good account of herself, making it as far as the semi-final. In other matches, former Casino coach Mick Sherry and Luke Edwards won the open men's doubles final 7-5 6-4 against Eli Bayliss and Adam Berrada. Casino's Bianca Nugent and Nessa Pratt beat top seeds Isabella Dempsey-Ceh and Molly in the open women's doubles. More than 150 players took part in the competition over four days at Ballina and Lismore.